It was 12 years ago that Matt Mickiewicz planted the seed that grew into what we now call the SitePoint Community. He started sharing his knowledge with people that were hungry to learn about web development and that generosity of spirit blossomed into the SitePoint forums. With the more recent additions of Facebook and Twitter to the community, we now have half a million members and a volunteer staff of approximately 50. Early last year a forum staff member pointed out to me that there is such a diverse range of talented people in the community that it is bordering on the criminal not to tap into that and harness the knowledge for something useful. And so in April 2010, the community book project was born. We put out a call across the spectrum of social media and asked people to register interest. A steering committee of forum staff members was formed and tasked with putting together what I guess you could call a wireframe (to borrow a familiar term) for the book. Because we didn’t want to limit people to specific subjects – that would be counterintuitive in a project that aims to showcase the diversity of knowledge that resides in the community – the concept was very loose. We decided on a book that would take a novice through the process of creating a website from start to finish. The response to our call for authors was huge. We asked people to put down a brief precis of what they intended to write and we had takers from across the gamut of web design – everything from configuring TCP/IP to SEO. We set a deadline for the first draft and asked people to start writing. We were excited. We envisaged the contributions pouring in and prepared the committee to read through the articles in order to make a first cut. It was our intention to take the submissions that made it through that process and apply them to our wireframe, to form the basis of the book. That is where things began to veer slightly off course. As is always the case, there is a natural attrition once people come up against deadlines. Life gets in the way and if there isn’t money involved, projects tend to take a backseat to the things that put food on the table. I get that. But I was disappointed by the number of people that didn’t front up. Not one to let go of a good idea, I decided to persevere with what we had, which was some great submissions by some incredibly talented and knowledgeable people – they just didn’t really gel into a comprehensive book. After going back and forwards a few times with some of the authors in order to get their articles to publishing standard, we were ready for the editors. All SitePoint books go through both an english and a technical editing process and that was where things got scary for me. Our technical editor pulled several articles that had made it through the committee and I started to wonder if we had enough material to make a book. It would have been heartbreaking to watch the project fall apart at that point, especially after all the work that was put in by the collaborative authors. But I needn’t have worried. 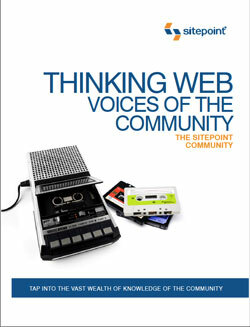 After several nail biting weeks, the edited book landed on my desk (in the form of a PDF in an email) and I got my first glimpse of what we christened Thinking Web – Voices of the Community. After sitting down with our designer and coming up with a cover, we were ready to launch. And launch we did. It’s not quite the step by step journey through the website creation process that we had dreamed up, but it is an interesting collection of articles. There is something for everyone, and best of all – it’s free to download. If you’re interested in having a read, you can find out more and download your copy here. If you like it, let me know. Who knows, we just might do it again one day. I’m a sucker for punishment.